Today saw us heading west across the Pyrenees to Esterencuby, about 5 miles from Saint-Jean-Pied-de-Port. However we were split on how to get there. While Gaz and Pete preferred the most direct route, the rest of us decided to go the scenic way. Before we left Saint-Lary this morning though Madame presented us with two apple pies for the onward journey. 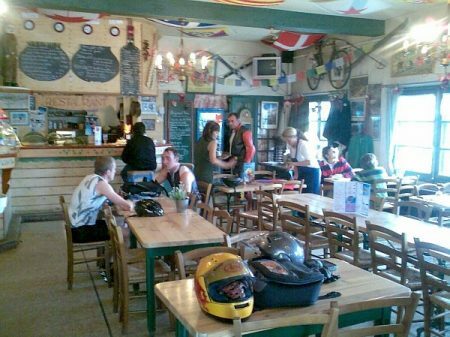 She also arranged for her father – who ran the local garage, to make a temporary repair on Chris’s bike. Yesterday he’d dropped his bike on some loose gravel and the bracket that held the rear brake lever had broken. Madame’s father refused to accept any money saying, “today it is you, maybe tomorrow it is me”. For the past couple of days we’d finished our rides over the Col de Portet d’Aspet. Today we left Saint-Lary over it and headed for Bagneres-de-Luchon. From here we joined the D618 which took us up and over the Col de Peyresourde to Arreau. And from Arreau we picked up the D918 and rode over the Col d’Aspin and Col du Tourmalet to Luz-Saint-Sauveur. The Peyresourde, d’Aspin and Tourmalet were all enjoyable and for Phil it was his second time to ride over them, having ridden them last in 2005. What the Peyresourde did highlight though was when riding in France be aware that they often patch roads up and leave a lot of loose gravel around after the repair – a nightmare when the gravel is left mid corner. In fact we came across one patch of road later in the day where they just appeared to have dumped tons and tons of gravel over a 4 mile stretch and it was like riding on marbles. At the top of the Tourmalet we stopped for a coffee and watched all the cyclists we’d passed on the way up grind their way to the summit. Unfortunately we rode straight past the classic Tourmalet photo opportunity – Le Geant du Tourmalet – a giant steel sculpture of a naked man on a bicycle. It was created by Jean Bernard Metais to commemorate the first passage of the Tour de France across the pass in 1910. At Luz-Saint-Sauveur the weather had closed in to the west, just where we were planning on riding over the Col du Soulor and Col d’Aubisque to Laruns. Unfortunately we made the mistake of continuing with the planned route and when we got above 1,300m we were in thick cloud and could see next to nothing. 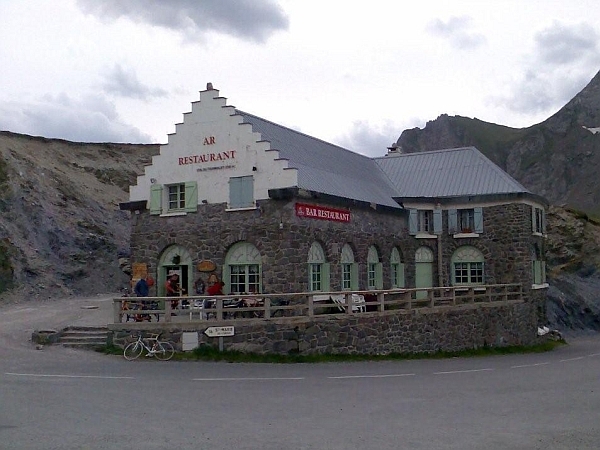 The road surface over the d’Aubisque was dreadful too, very narrow and deformed, and not recommended. From Laruns we hacked our way cross country to Esterencuby where we received a truly miserable welcome at Hotel des Sources de la Nive. Without doubt this must be the worst hotel any of us have ever stayed at which is a shame because the location is good and very picturesque. While the rooms are clean and comfortable, and food very good, sadly the attitude of the staff is appalling and they really shouldn’t be running a hotel if it makes them that miserable. Today was our final day in the Pyrenees and saw us returning to Santander. Nobody wanted to stay in the hotel for a minute longer than was absolutely necessary and Gaz and Pete left a good while before anyone else. 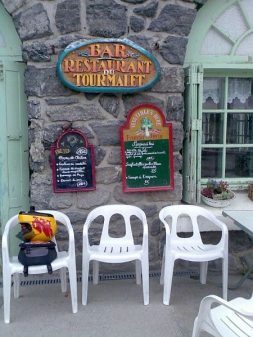 The rest of us left in ones and twos and less by design and more by accident ended up meeting a few miles down the road for breakfast in Saint-Jean-Pied-de-Port – the customary starting point of the Camino de Santiago pilgrimage route, or the Way of Saint James as it’s known in English. The fastest route suggested by our sat navs was straightforward enough however our early breakout from the hotel from hell meant time wasn’t an issue today. Over coffee we agreed that we didn’t want to be kicking our heels at the ferry terminal so decided to squeeze in one more pass before beginning our run down the motorway. Leaving Saint-Jean-Pied-de-Port we turned left up the D933 and headed towards the Puerto de Ibaneta. 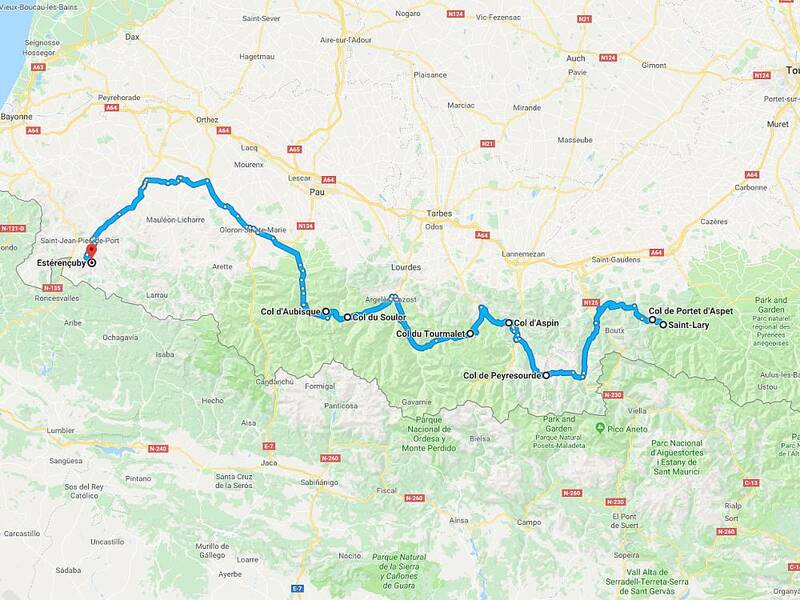 The pass itself lies just outside Saint-Jean between the towns of Luzaide/Valcarlos and Roncesvalles and goes by several other names including the Roncesvalles Pass and the Roncevaux Pass. It serves as a link between France and Spain and the D933/N135 really is a fabulous biking road. We particularly liked the first 30 mile section that had been completely resurfaced all the way to Zubiri. Once we hit Pamplona we jumped on the motorway and from here it was simply a case of following signs to Vitoria-Gasteiz and Bilbao and eventually Santander. Despite the heavy traffic on the run into Santander we arrived with plenty of time spare although for those with wider panniers, filtering past all the cars had proved tricky. As a result we all got split up before finally arriving at the ferry terminal in dribs and drabs. We didn’t actually meet up again until we were on the ferry. One by one we checked in to our respective cabins, got showered and changed, and headed to the bar where we knew everyone would be waiting – except we appeared to be short to the tune of two – there was no sign of Gaz or Pete. Now there are three sides to every story. There’s yours, there’s mine… and then there’s the truth. However this is the version that the rest of us were given by Gaz and Pete. 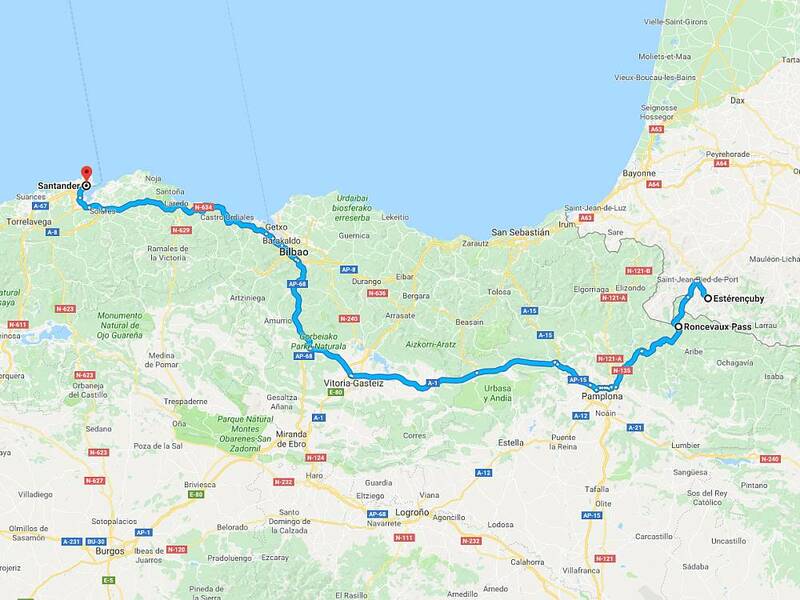 Their plan had involved giving Pamplona a miss and taking the direct route to Santander via Biarritz using the coastal motorway. However somewhere between the hotel in Esterencuby and them stopping for breakfast Pete’s immobiliser button had fallen off his key ring. The result of this was after they’d stopped for breakfast – coincidentally in the same town we’d all stopped at, Pete couldn’t restart his bike. It took 3 hours to remove the bike plastics, find the wiring loom, and then remove the immobiliser from it. Now Saint-Jean-Pied-de-Port isn’t a big town but unluckily for them we’d missed them because while we’d turned left up the D933 to go over the Puerto de Ibaneta, they were parked up a couple of hundred yards after the turning. By the time Pete’s bike had been put back together it was midday. Now this still left them with more than enough time get to Santander and make the ferry. It was 185 miles, 150 of which were motorway miles, and they were both riding Honda Blackbirds that will cruise all day long at 100mph. For some reason though they’d got it into their heads that the 4pm departure time marked on their tickets meant 5pm local time. At 4.25pm Phil got a call asking “where are you?” and “where’s the ferry?”. Not quite understanding Phil answered that he was in the bar, on the ferry, that had left 25 minutes ago. “Oh” was the response followed by silence before the call was dropped. Another 5 minutes and Phil’s phone rang again. 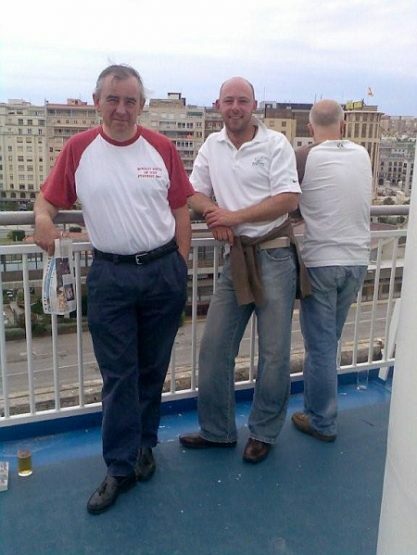 “No problem” said Pete, “we’re going to stay in Santander tonight and catch the next crossing tomorrow”. Phil informed him that the next sailing wasn’t for another 4 days. Stunned silence on the other end of the line before a “we’ll speak later” and for a second time the call was dropped. 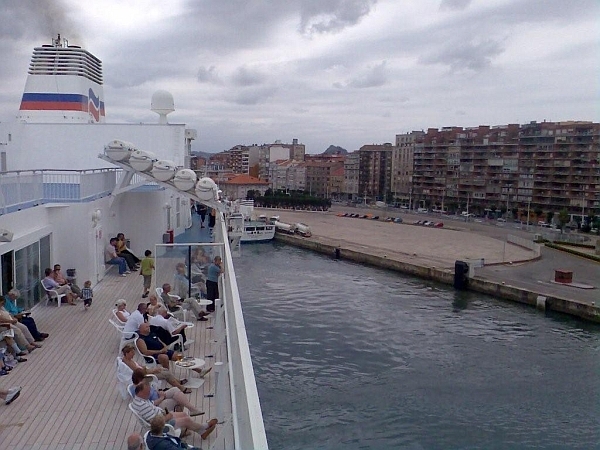 In any event, after a bit of phoning around they eventually managed to get themselves booked on the Bilbao-Portsmouth crossing that left the following day. And they were lucky to get that because the biggest gay pride festival in Europe, held in Madrid, had just finished and virtually every bike space had been pre-booked by the UK attendees who were returning home. Mind you they looked a lovely couple with their matching silver Blackbirds. The moral of the story – one of them at least, is take a spare key with you. Oh, and read your ferry ticket properly! The overnight crossing was good. We had a great meal and a few bottles of fine wine between us, and a decent nights sleep. All that remained was a 200 mile dash up the motorway. The ride back was pretty uneventful and we all made it back in time for lunch – except Gaz and Pete of course who didn’t make it back to Bewdley until 10pm the following day. It was a good second tour and everyone had a great time with the Millau group eventually covering around 2,600 miles and Santander group around 1,600 miles. We were split as to which the better option had been, to ride to down through France or take the ferry to Spain. Taking into account fuel and accommodation, and wear and tear on the bikes, it was definitely more expensive to ride down. On the other hand by taking the ferry you lose a few days of riding time, and after all, it was a riding holiday. Next year we’re thinking of returning to the Haute-Alpes in south-eastern France. Possibly putting the bikes on the Motorail from Calais to Nice and letting the train take the strain this time.